It is a great honor and privilege to serve at the Altar of God. 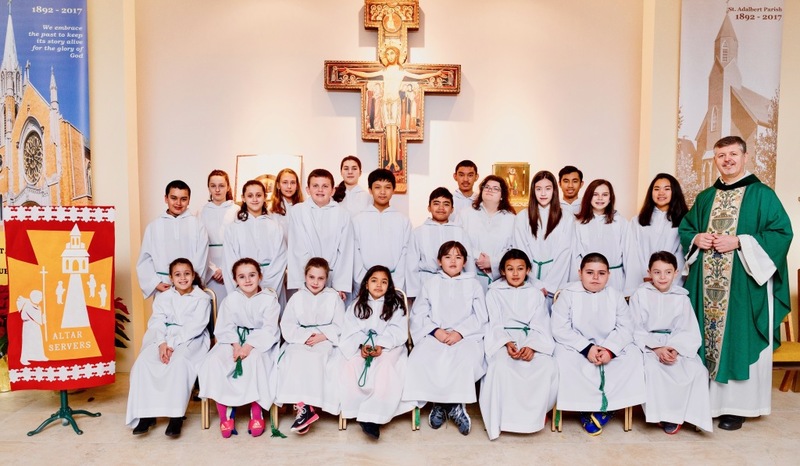 Saint John Paul II said in his inspiring homily to altar servers on August 1, 2001; "The altar server has a privileged place in liturgical celebrations. Those who serve at Mass present themselves to a community. They experience from close at hand that Jesus Christ is present and active in every liturgy...Above all, you are servants of Jesus Christ, the eternal High Priest." Thank you Altar servers for your great service. Those wishing to become an altar server please contact the coordinator. Contact: 718-639-0212 or simply ask any of the friars after Mass. This ministry is one that is open to Young People who have received Baptism and Eucharist as well as confirmed adults. Those young people who choose to serve at the Altar of the Lord are providing a wonderful service to all of us as well as the priest who they serve with. It is a ministry which requires preparation, practice and dedication. The Ministry benefits the Server as they learn the rituals of our catholic faith in a very personal manner which can only enhance their faith. At one time there were six Altar Servers at every mass. This is no longer the case. Will you come and serve ? We will be happy to train you !!! Adults who minister in this capacity certainly receive the same benefits but also provide and additional service to the parish community in the area of bereavement. If you are available during the day and would like to learn more about this ministry speak with Fr. Mirek or one of the Friars. Founded 125 years ago by the first pastor, Fr. Joseph Fyda, altar servers have been an integral part of liturgical celebrations at St. Adalbert Parish. Dedication is perhaps the best term to describe these individuals who were and still are faithful to their ministry. Essential to the development of this ministry was the commitment of the moderators. These friars guided the youngsters through the liturgical changes affecting the celebration of Mass. Throughout the years, activities were planned to provide for social interaction as well. St. John Paul II said in his inspiring homily to altar servers on August 1, 2001: "The altar server has a privileged place in liturgical celebrations. Those who serve at Mass present themselves to a community. They experience from close at hand that Jesus Christ is present and active in every liturgy...Above all, you are servants of Jesus Christ, the eternal High Priest." This ministry is one that is open to young people who have received Baptism and Eucharist as well as confirmed adults. Those young people who choose to serve at the Altar of the Lord are providing a wonderful service to all of us as well as the priest who they serve with. It is a ministry which requires preparation, practice and dedication. The Ministry benefits the Altar Servers as they learn the rituals of our Catholic faith in a very personal manner which can only enhance their faith.